Who is Kevin the Vampire Cat? 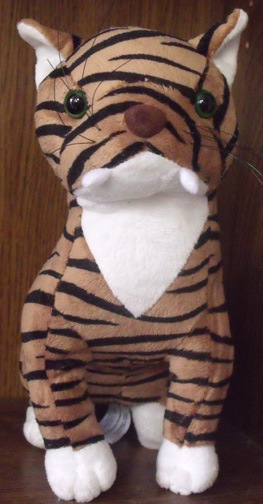 On October 9, 2011, Kevin, beloved former resident of the Catman2 Shelter and inspiration to author, Dr. Harold W. Sims, has posthumously been made the official mascot of Catman2 Inc.
Kevin arrived at the shelter as a young kitten. He and his three sisters were feral. Two of the sisters were, in time, adopted and went to live on a farm. Today their fate is unknown. Kevin and his sister, Taffy, remained in the shelter. Both lived in a semi-feral existence but Kevin took it upon himself to become a helpful ambassador and mentor to all new cats that came to Catman2. Although it may seem anthropomorphic to some, everyone who knew Kevin saw him as a friend to all new cats. Until he aged and his two upper canine teeth protruded, no one made much of his mission. The name “Vampire Cat” started as a joke, but soon Kevin was given the name “Kevin the Helpful Vampire Cat”. Kevin passed away about two years ago but his legacy lives on in the three books Harold has written about him. 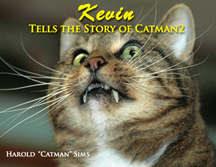 “Kevin the Helpful Vampire Cat”, “Kevin Tames the Bullies”, and “Kevin Tells the Story of Catman2″. He has also been immortalized by the creation of a doll in his image. In 2014, an educational music video was made about Kevin with a message on anti-bullying. 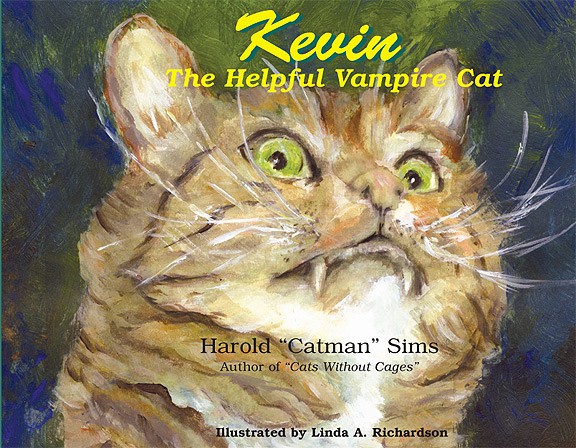 Kevin the Helpful Vampire Cat is the first of a trilogy of books written to inspire young children to be kind and helpful to others and to inspire dreamers to become doers. This is the story about a very sweet tabby cat who earned the name “Vampire Cat” when his two upper canine teeth enlongated as he aged. But Kevin is not your typical vampire. Rather than going around saying, “I Vant Your Blood”, his motto is: “Don’t ask what others can do for you; ask what you can do for ohers.” So he becomes Kevin the Helpful Vampire Cat and helps all new cats coming to the shelter adjust to life there. He asks little for himself and gives love and comfort to all the cats he meets. Kevin is a role model for children of all ages and this book is a must-have for your child’s library. Kevin Tames the Bullies tells the story about a time when some of the shelter cats teased and made fun of Kevin for his rather long teeth. Some of the bullies are cats that Kevin helped adjust to living in the shelter. Kevin is hurt. He befriended them and now they tease him for something he has no control over. At first Kevin wants to fight back – “I’ll show them”, he says to himself. Then he stops and thinks, “If I fight and beat them up, I’ll be a bully too”. So Kevin comes up with a plan – a non-violent way to solve the problem. He executes his plan and the bullies see things in a different way. They learn that being different isn’t one’s fault. They come together and say, “Let us end this helter skelter and live together in Catman’s shelter.” Peace and friendship returns and all are happy. In the third book, Kevin and his friends ask Catman to write a story about his dream to build their shelter. Catman tells the story, saying that if you have a dream, you can make it come true if your dream is realistic and you work hard toward your goal. 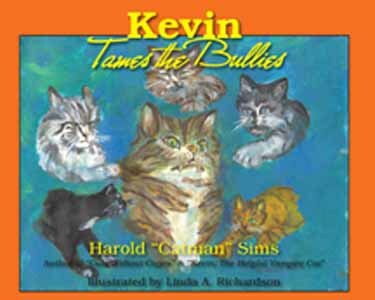 Harold Sims, President and author of the Kevin Trilogy has put his talents together to produce a musical video, aimed at preventing young children from becoming bullies. By relating the actions of a cat in his shelter, and much of his own imagination, Harold weaves a tale about Kevin who befriends new cats coming in the shelter door and teaches them the ways of shelter life. Later on, Kevin is bullied by some of the same cats he had once embraced. But Kevin, not wanting to become a bully himself and fight them back, forgives each and every nasty attack and tells the bullies that we can’t help it, that we all differ in some strange ways and that we must end this helter-skelter and get along in this small shelter. In the end, the cats all agree that Kevin is right, bullying is absurd. He tames the bullies one and all, fellowship and love once again fill the hall. Lyrics by Harold Sims, colorful illustrations by artist Linda Richardson, and a catchy tune by Grammy winning musician Arthur Stead, and his wife Leslie make this production an educational tool with a tune that will resonate in your head for days. A Must See for all Children: Pre-School, K-4. Anyone who donates $20 to Catman2 can request a FREE copy, which includes a teacher/parent's guide. All funds will go to the shelter. Harold takes no royalties or other income. All profits from this Video help Catman2. DONATE A COPY TO A SCHOOL NEAR YOU! Crafted from the real Kevin’s likeness! Available by itself or in a package deal with the book trilogy.